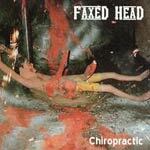 All glue-sniffing teenage survivors of a suicide pact gone horribly awry, Faxed Head is a decidedly twisted death metal band, despite its members' new physical (and to a certain extent, mental) handicaps caused by their ordeal. Placed in a series of county and state rehabilitation programs, the bandmembers underwent physical reconstruction and mental therapy at the Coalinga Youth Hospice before forming this band. 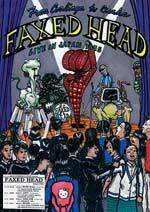 The most recent Faxed Head lineup is composed of headless/elongated-neck guitarist Neck Head, plaid-tartan skin-graft victim/wheelchair-bound vocalist McPatrick Head, oddly-handicapped musician Jigsaw Puzzle Head on bass, LaBrea Tar Pits Head on drums, and local mime/metal-detector-operator named Fifth Head providing electronics. 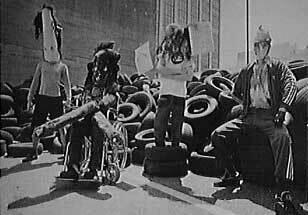 Beautifully shot on three cameras during Faxed Head's improbable 1995 tour of Japan, From Coalinga To Osaka documents the pride of Coalinga, CA in all their self-handicapped, brain-damaged glory. Live footage of the self-proclaimed “desk metal” quartet is interspersed with baffling but authentic footage of a Japanese junior high school class in which the students are being instructed on the subject of... Faxed Head! In addition to the electronics- and mayhem-heavy 1995 Osaka set, the DVD includes bonus live footage of a reconstituted (and much more metal-sounding) Faxed Head on tour in Canada in 2001. And, for the true fan, a 45-minute long hidden "Easter egg" showcases an entire concert by Faxed Head's long-time nemesis, pitiful Coalinga-area boogie-blues idiots The Bon Larvis Band. "As far as this genre of music goes, the disc is as crunchy as Grape Nuts, bizarre as a Twilight Zone episode, fast and relentless as a car crash, and, refreshingly, smart stuff. Bonus points for the great bandmember names: McPatrick Head, Neck Head, Jigsaw Puzzle Head, LaBrea Tar Pits Head, and Fifth Head. You can't beat that."